Second row Romain Millo-Chluski was something of a slow burner for France. After playing in the Under-21 side in the 2003 World Championship and against Ireland and Italy in 2004 he made his Test debut against South Africa on tour in Durban in 2005 but had to wait until November 2008 for further caps against Argentina and the Pacific Islanders. 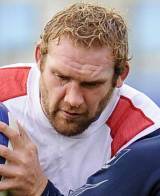 Millo-Chluski, who has Polish ancestry, was drafted into the France squad during the 2008 Six Nations Championship ahead of the clash with England but was subsequently ruled out of action with an Achilles tendon injury. He joined Toulouse from RC Massy Essonne at the age of 19 in 2002 and was on the bench covering Patricio Albacete and the long-serving Fabien Pelous when the club won the 2008 Top 14 final, 26-20, against Clermont-Auvergne at Stade de France. Having missed the 2011 Six Nations through a torn calf muscle, Millo-Chulski was recalled to Lievremont's 33-man preliminary World Cup squad.